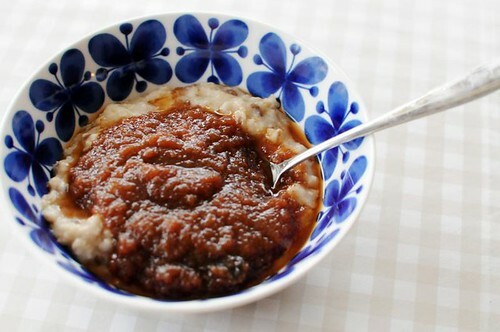 Apple butter is like a very reduced apple sauce and brown and thick. It's nice on oatmeal, but also with ice cream, pancakes or as a filling for various baked goods. I made mine in the crock-pot which was very convenient! You can do it on the stove, but you'll have to watch it to make sure it doesn't burn. I know it's a huge portion in the photo, but I was scraping out the remains after filling a few jars, and it's so delicious I couldn't stand to throw any of it away. Start this in the afternoon, and then you can add the sugar and spices overnight. Put the apples in your crock-pot. Cover with a lid and place on low heat for four hours. Stir, and mash up the apples. Cover with the lid, and cook on low heat for eight hours. And that's it! Pour into jars and keep cool - or freeze, which is what I do. I LOVE apple butter--but have never made any. Do you use the sweeter apples or the more tart ones or does it matter? We are just now starting to pick our pears and I think our apples will be ready in another 2 weeks or so (I hope). Aimee, I don't think it matters much really! I used fairly soft apples, pretty tart. That sounds so, super delicious! I could use it on oatmeal, toast, cookies... and the best part is the crock pot - easy for me, yummy for everyone else :) Thanks Anne! !